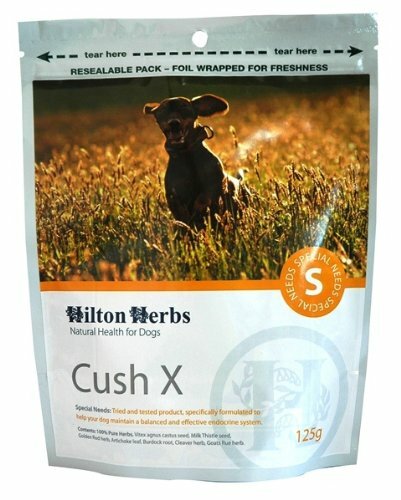 Hilton Herbs Cush X is a natural herbal supplement which helps to maintain a balanced endocrine system in dogs. It also maintains healthy kidney and function as well as improving energy levels and general coat condition. Safe to use in conjunction with conventional medication. Vitex agnus castus seed, Goats rue herb, Bilberry fruit, Artichoke leaf, Milk Thistle seed, Golden rod herb, Burdock. Divide daily amount between two meals if possible. There are currently no questions for Hilton Herbs Cush X for Dogs - be the first to ask one!